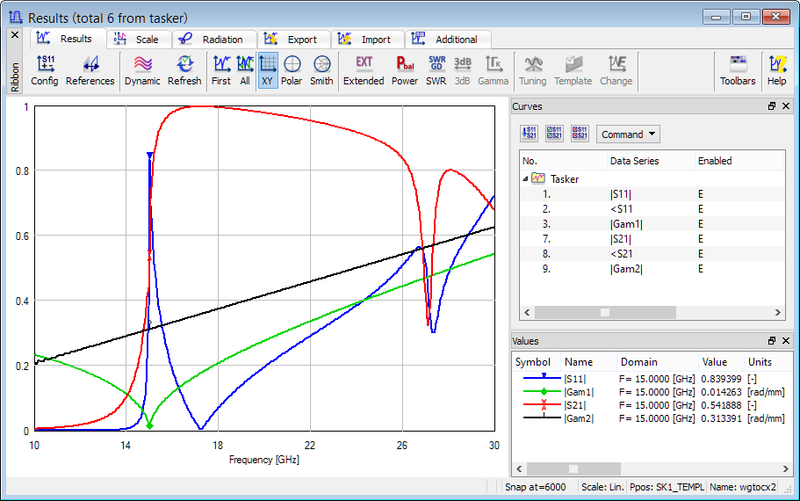 S-Parameters results of a rectangular waveguide to coaxial line transition example. As an example of below cutoff calculations, the results for rectangular waveguide to coaxial line transition may be considered. |Gam1| and |Gam2| denote the absolute values of propagation constants in the transmission lines terminated by ports 1 and 2, respectively. It can be seen that at port 1 (waveguide input) the propagation constant drops to 0 at the waveguide cutoff (15 GHz), while at the TEM output |Gam2| is naturally proportional to the frequency. Let us have a closer look at the values of |S11| and |S21| below the cutoff frequency. Naturally |S21| drops fast with decrease of the frequency. But what may seem less intuitive, there is also a fast decrease of |S11|. This is because even below the cutoff a long section of waveguide is reflectionless and thus its |S11| must tend to zero with the length of the section increasing. Let us also note that zero reflection does not imply any transmission of a real power into the guide since the characteristic impedance of the guide (equal to the reference impedance for S-parameter definition) is imaginary below the cutoff frequency. More discussion about interpretation of the S-Parameters below cutoff can be found in ref. .
See also online documentation about below cutoff calculations.